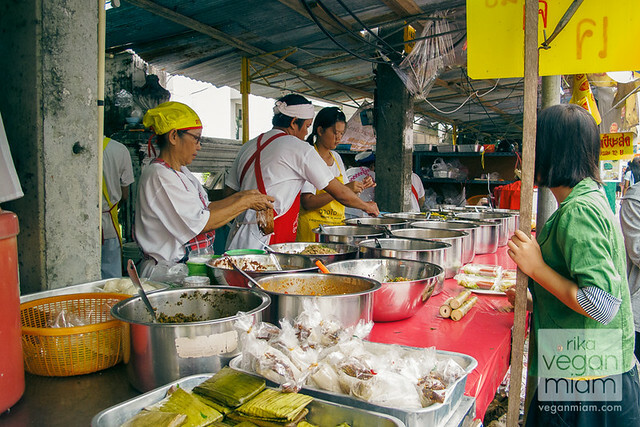 Read our Phuket Vegetarian Festival: Vegan Street Food II feature for more updated and detailed information on this event including some of the typical vegan food available. 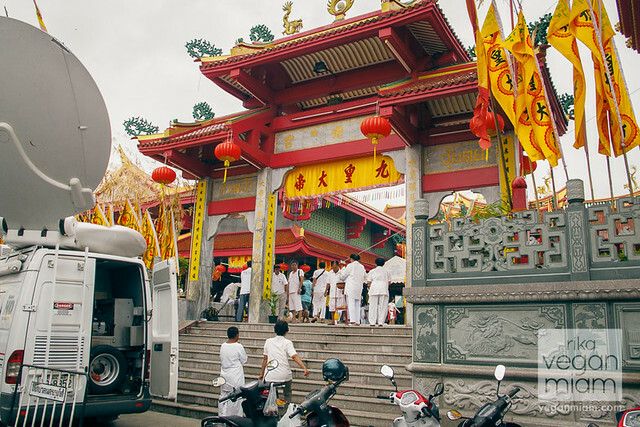 In the days leading up to the Vegetarian Festival, the street-sides are slowly being transformed into vegan hawker stalls. Along the highways in the vacant parking lots, in empty fields and popular markets, kitchens are being constructed. 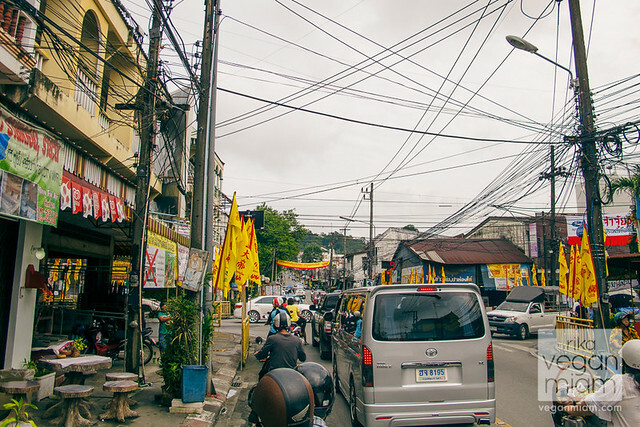 You will know you are near a temple in Phuket by the number of red and yellow Jay/เจ flags you see, the roads leading to temples are packed full of street-side vendors and the adjacent lots turned into virtual vegan smorgasbords. hold on, what is Jay/เจ? Read here. 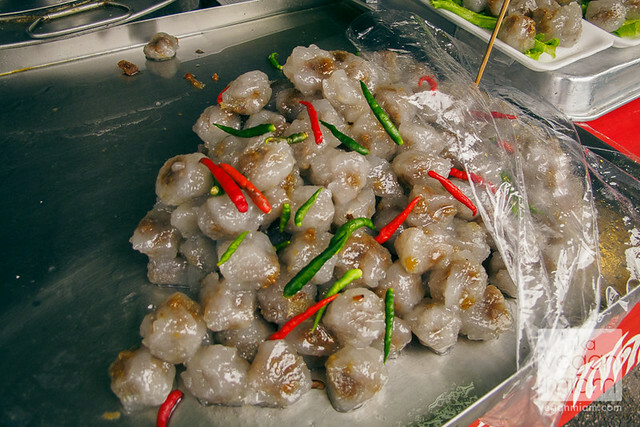 Due to the Chinese origins of the festival, and large Chinese diaspora in Thailand, there is a distinctive Chinese flavor to a lot of the food. Dishes are often Thai, Chinese (mostly Hokkien) or a fusion of the two. 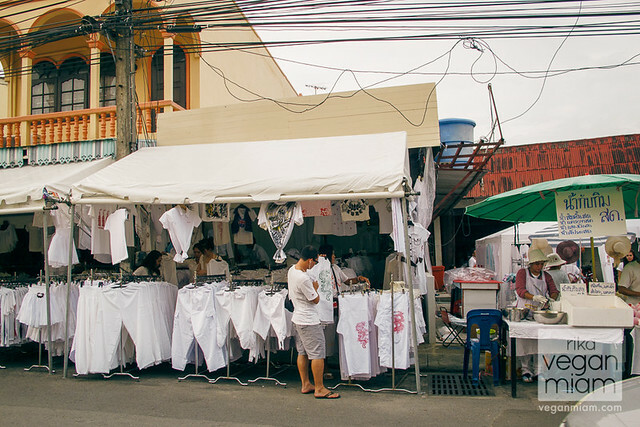 Ranong Road in Phuket Town is probably the largest example of this transformation, the blocks leading to the Jui Tui Shrine are temporarily lined with a variety of food stalls. 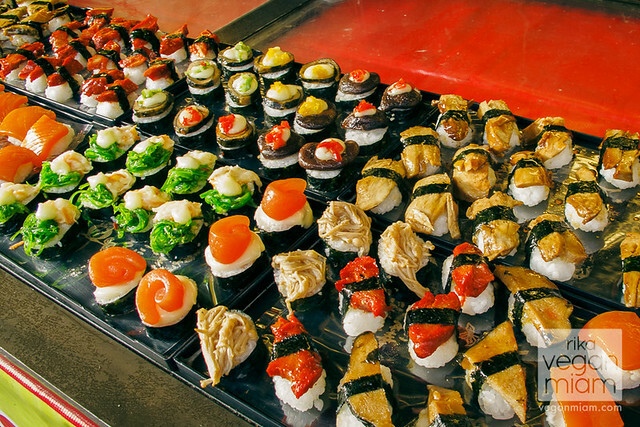 These stalls typically have a specialty, and while a lot of vendors offer just one dish at their stand, some offer a selection of dishes and delectable treats. 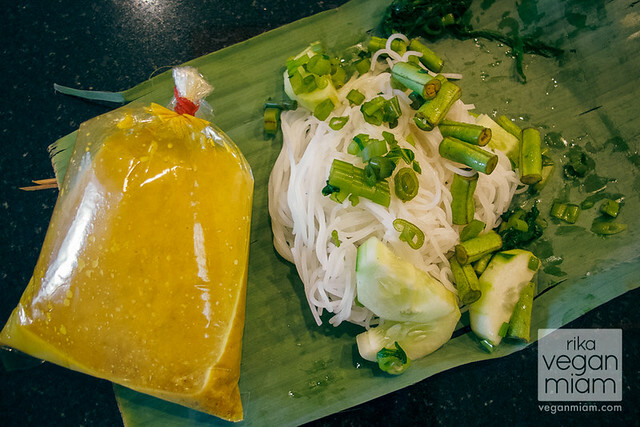 Nearly all the food photos in this post take place at Ranong Road in Phuket Town. One must, however, be careful and pay attention to the signage at each vendor. 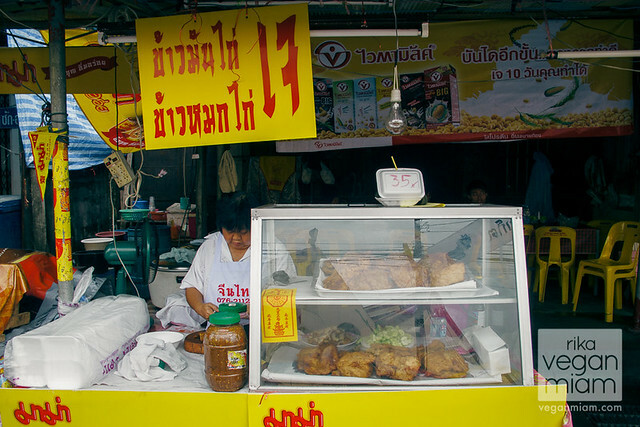 While most are vegan, there is the occasional vegetarian stall that might use condensed milk or other lacto-vegetarian ingredients. 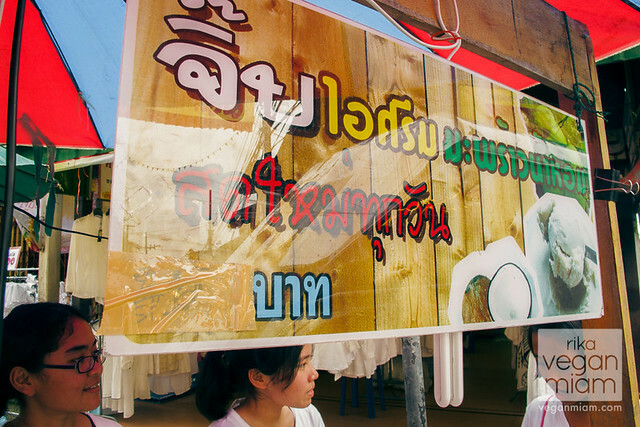 These stands, in our experience, didn’t display the Jay/เจ flags and were usually easy to spot because of the condensed milk cans on display. To be careful, be diligent and if ever in doubt, simply ask the vendor if their food is Jay and they will let you know. It never hurts to ask and in most cases the vendors are eager, and often quite proud, to explain how their products don’t contain any animal products. 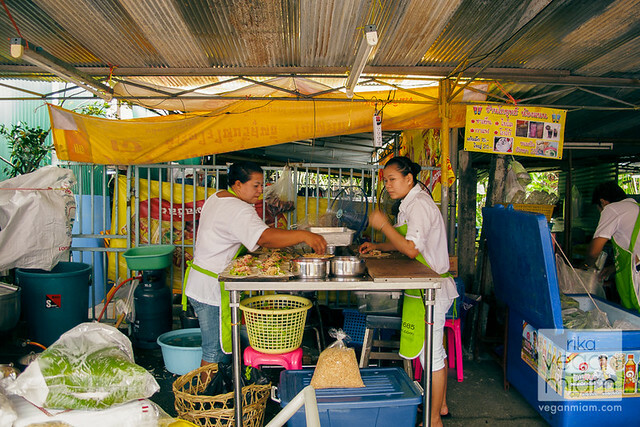 Since a lot of the food is prepared in large batches, some of the dishes might be spicier than you are accustomed to since they haven’t been toned-down for Westerners…and I love that! 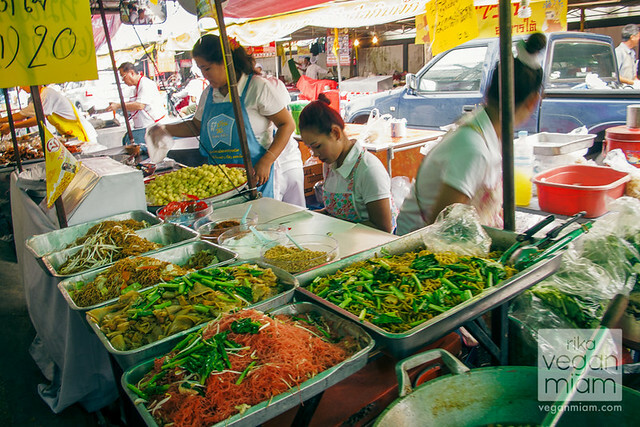 The Vegetarian Festival is a religious celebration that represents spiritual cleaning and is celebrated throughout Thailand with the largest celebration taking place in Phuket. The festival begins on a new moon in the 9th lunar month of the Chinese calendar. For 2013, the Vegetarian Festival will take place October 5th-13th. We were in Phuket for the Vegetarian Festival in October 2012. 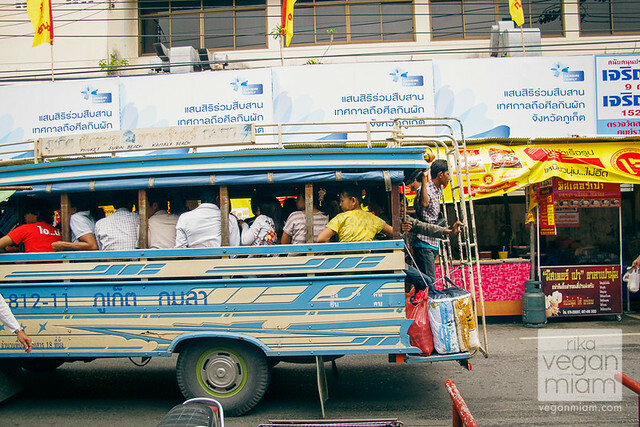 We stayed in Phuket for about a month from ending September to ending October of 2012. Phuket Vegetarian Festival: A temporary vendor along Chalong Road, but we prefer the Ranong Road area for more vegan food varieties. Phuket Vegetarian Festival (Ranong Road, Phuket Town) Please note, all photos below are taken at Ranong Road, Phuket Town. 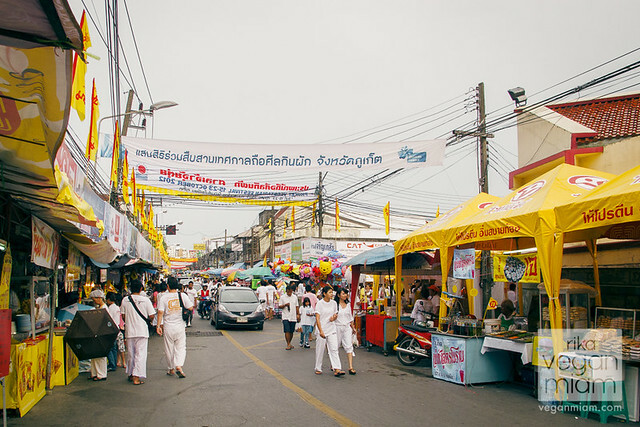 Phuket Vegetarian Festival (Ranong Road, Phuket Town): There is a number of red and yellow Jay เจ flags you see. If not, they aren’t vegan, but lacto-vegetarian or may contain milk. 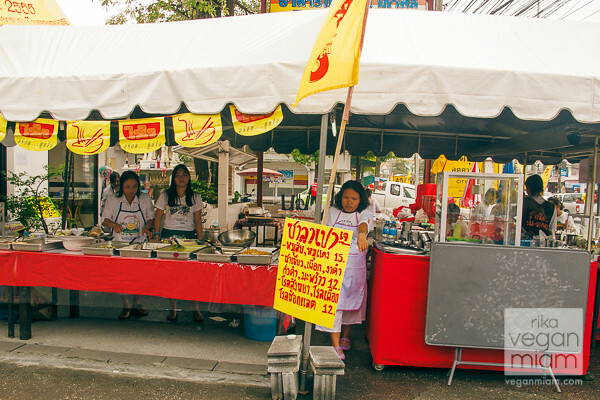 Phuket Vegetarian Festival (Ranong Road, Phuket Town): Hardworking ladies prepping for the food festival. 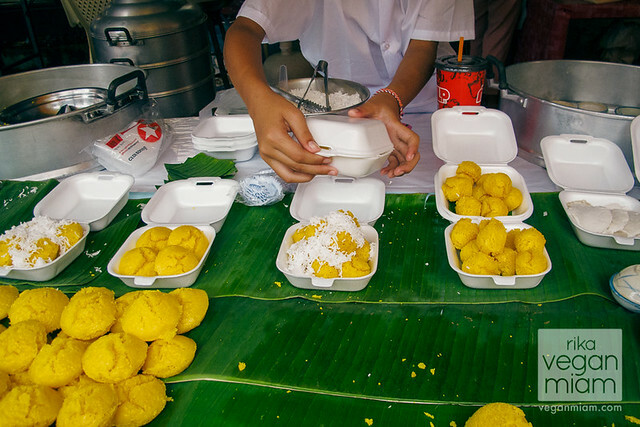 Phuket Vegetarian Festival (Ranong Road, Phuket Town): These delectable and sweet & savory steamed tapioca balls/dumplings are known as, Saku Sai Moo. 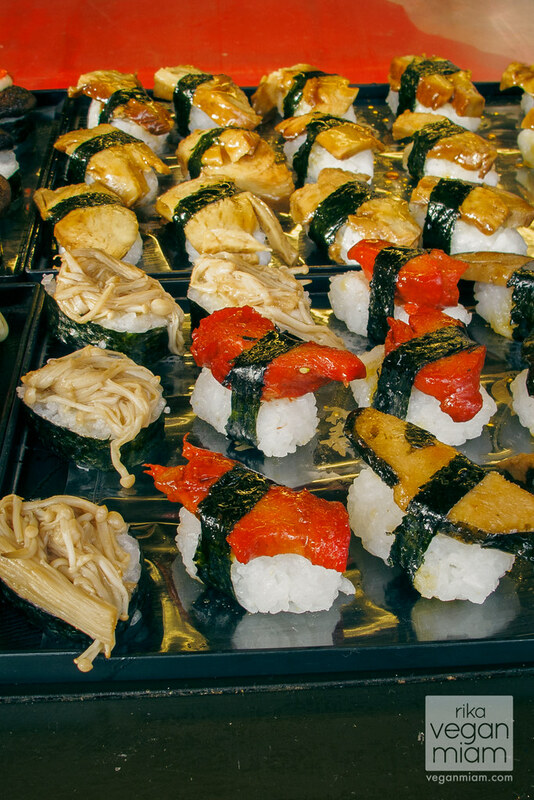 They are a popular street snack. 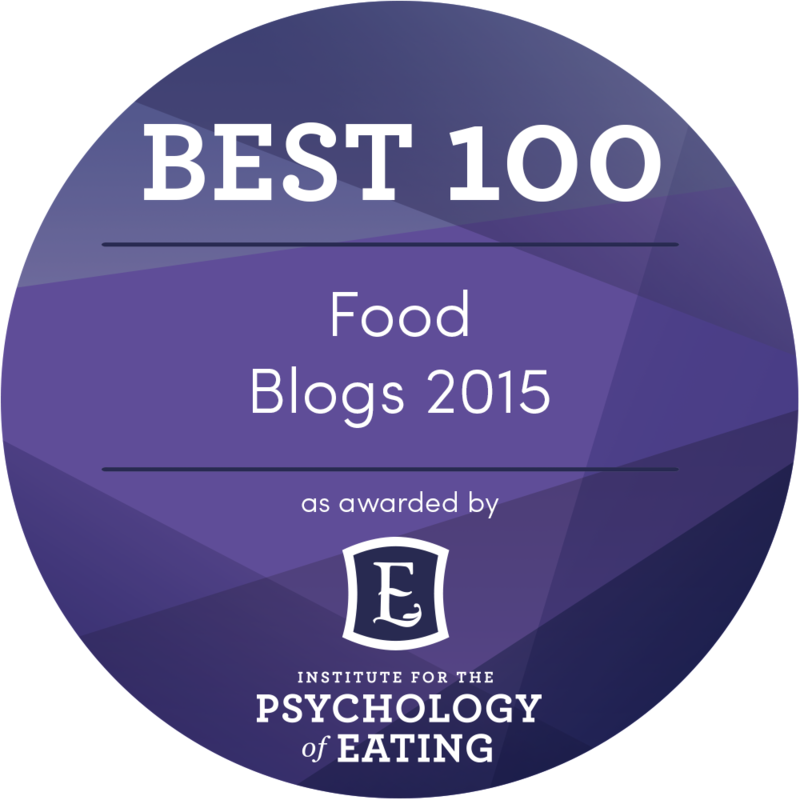 They are a perfect “amuse-bouche”, intended for one bite. The savory & sweet filling is mostly palm sugar, toasted peanut, cilantro roots and soy meat, and served with fresh lettuce and Thai chili peppers. These were pretty good! Phuket Vegetarian Festival (Ranong Road, Phuket Town): Vegan Saku Sai Moo served with fresh lettuce and Thai chili peppers, you can taste the heat from the peppers, the sweet and saltiness from the fillings, and the sticky texture from the tapioca exteriors. 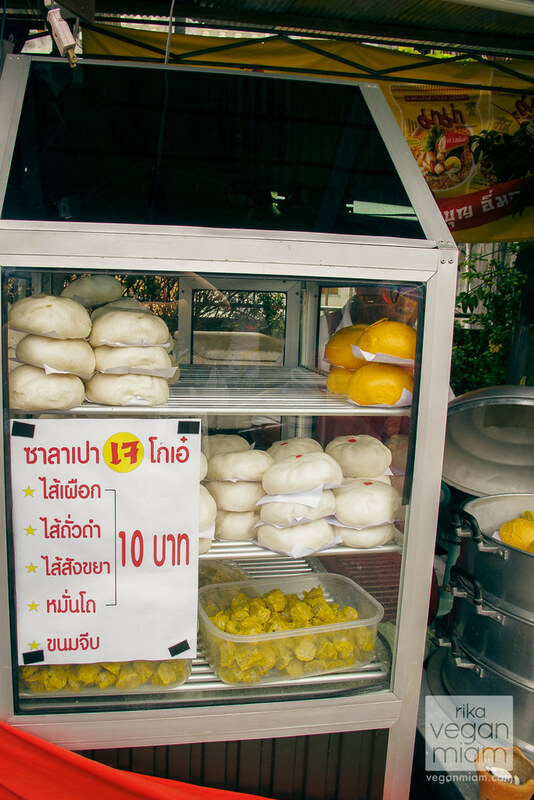 Phuket Vegetarian Festival (Ranong Road, Phuket Town): Vegan bao-zi or stuffed buns/baos, very delicious after being steamed – only 10 THB each (~$0.32). The red markings indicate savory. Vegan “shu-mai” dumplings at the bottom shelf. 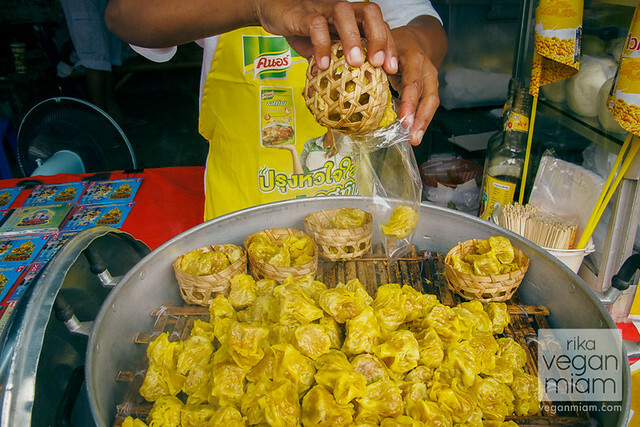 Phuket Vegetarian Festival (Ranong Road, Phuket Town): Vegan yellow “shu-mai” dumplings, or also known as Khanom Jeeb Gai. 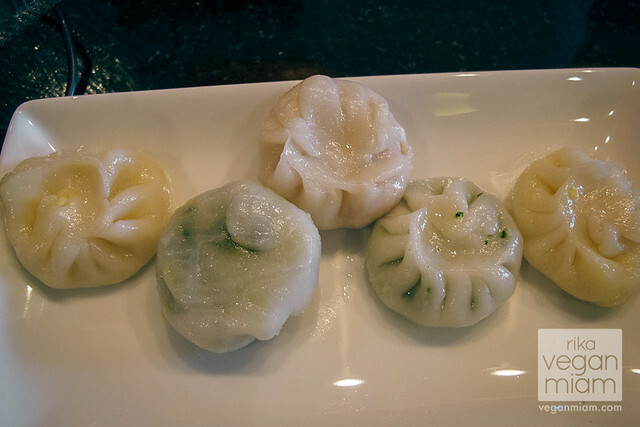 These dumplings used to be my favorite dim sum dish before I became a vegan. Unfortunately they weren’t that good, too dry and lacking texture, but still awesome to see them at the Festival. 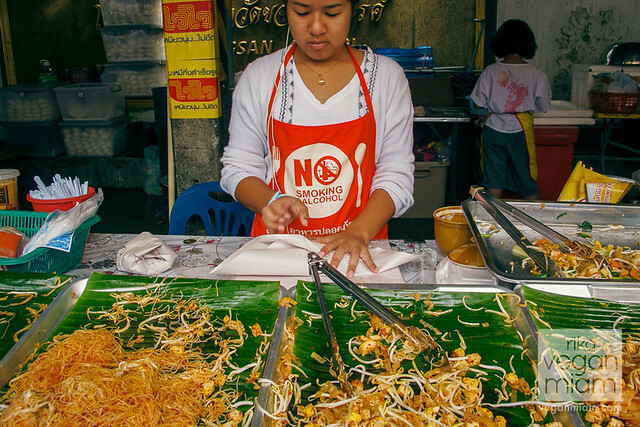 Phuket Vegetarian Festival (Ranong Road, Phuket Town): This is our favorite noodle stall and this girl rocks – because they got loads of chiles in it with yellow tofu! 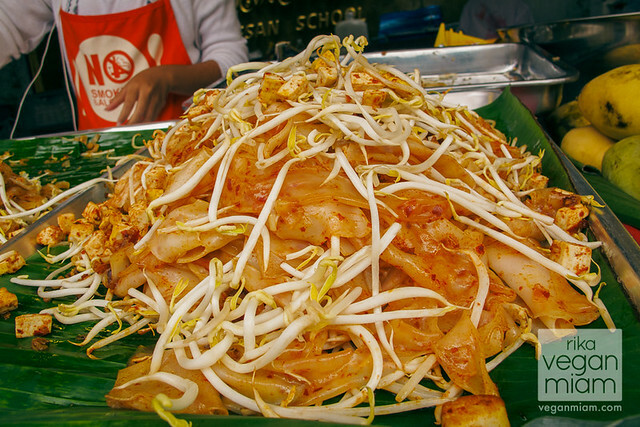 Phuket Vegetarian Festival (Ranong Road, Phuket Town): Look at this beautiful Thai noodle dish – fried broad rice noodles with fresh bean sprouts, yellow tofu and loads of chiles. It is mildly spicy, but if you add extra chili flakes, yes, it’ll be extra extra spicy. 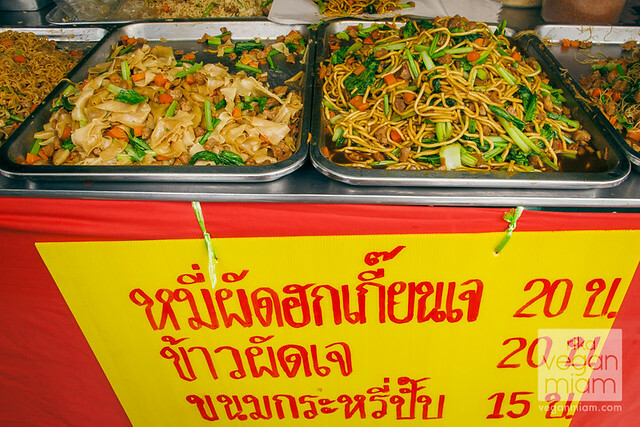 Phuket Vegetarian Festival (Ranong Road, Phuket Town): Vendors of vegan noodles (15 – 20 THB) – all sorts of noodles from flat rice to Hokkien noodles (the yellow ones) with an array of vegetables and soy protein (or gluten). 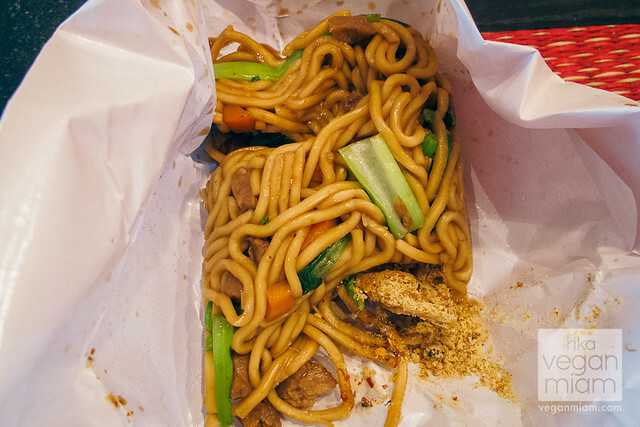 These noodle dishes are not spicy at all nor have a lot of flavors. All noodles were drenched in sweet soy sauce with the same ingredients. However, these noodles are perfect for anyone who doesn’t like spicy noodles. You will need loads of chili flakes and crushed sweet peanuts for these dishes. 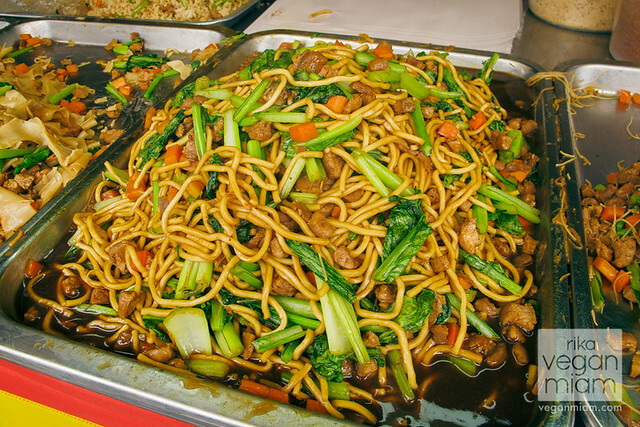 Phuket Vegetarian Festival (Ranong Road, Phuket Town): Hokkien Noodles with an array of vegetables and soy protein, drenched in a sweet soy sauce. 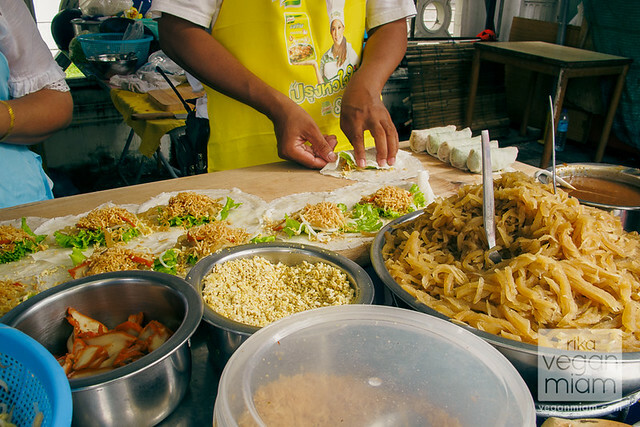 Phuket Vegetarian Festival (Ranong Road, Phuket Town): Expect your Hokkien noodles to be wrapped in a paper – deli-style! You will see extra condiments – crushed peanuts/sugar and chili flakes, but that was a pretty small amount (the more, the better). We didn’t like the dish, it was pretty bland. Phuket Vegetarian Festival (Ranong Road, Phuket Town): Pad See Ew , it is a very simple noodle dish made of fried broad rice noodles with an array of vegetables and soy protein in sweet soy sauce (and possibly light soy sauce). It is very similar to the “Char Kway Teow” of Singapore and Malaysia. That dish was really boring – we liked the noodles, but the flavor wasn’t there. Phuket Vegetarian Festival (Ranong Road, Phuket Town): This is one of the most common Asian dishes known as, Popiah (Fresh Spring Rolls). 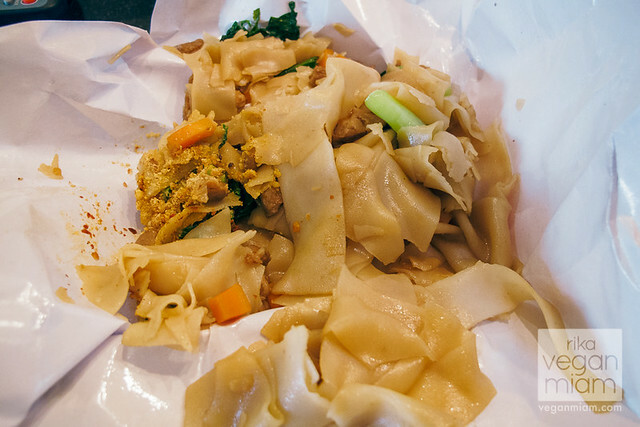 In Thai, they are known as, Poh Piah Sod . You will find them, too in Malaysia, Taiwan, Singapore and China including Hokkien-speaking areas. 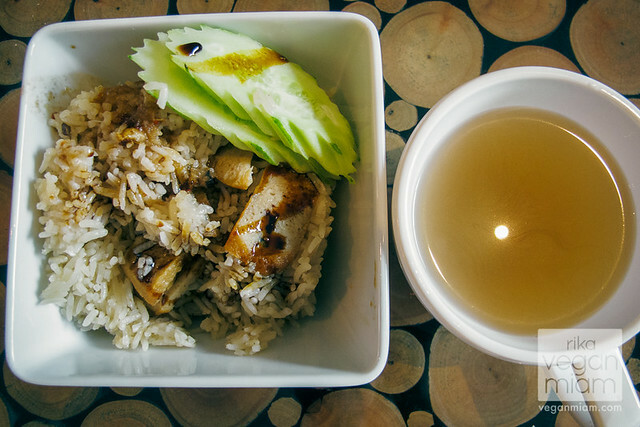 Notice the bowl of stir-fried turnips on the right, the covered bowl contained fried shallots, and on the left, you will see vegetarian Char-Siu Red “Pork”, and the middle bowl contained crushed peanuts. These fresh spring rolls are wrapped in soft, thin paper-like crepe and filled with shredded vegetables and others (normally with Chinese sausage), hence accompanied with a sweet bean or hoisin sauce. 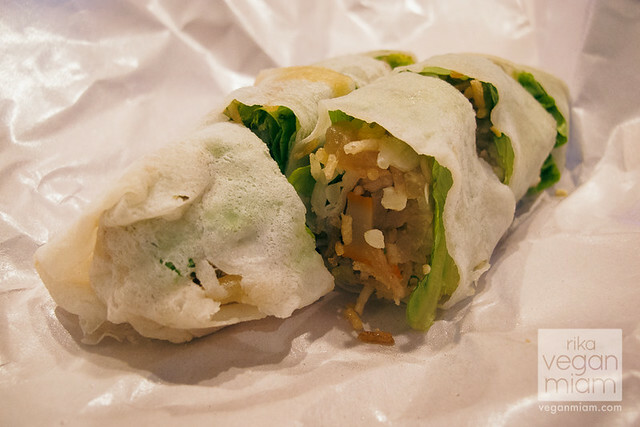 However, the vegan Popiah rolls contain stir-fried turnips, chopped peanuts, vegetarian Char-siu “Pork”, lettuce leaves, fried shallots, bean sprouts, and of course a sweet peanut-hoisin(like) sauce. Phuket Vegetarian Festival (Ranong Road, Phuket Town): This is one of my favorite stalls run by the Hokkien – fried Chinese turnip cakes – they are kind of greasy for me, but still good. 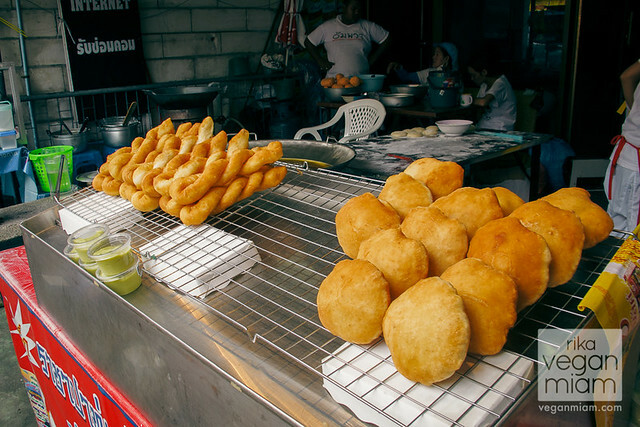 I could smell the white pepper from the fried cakes made of shredded radish (typically Chinese radish or daikon) and plain rice flour. 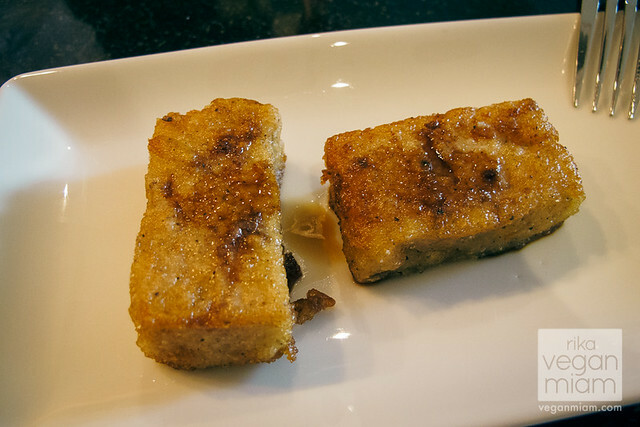 I prefer them with shiitake mushrooms, but these were just plain and fried turnip cakes. 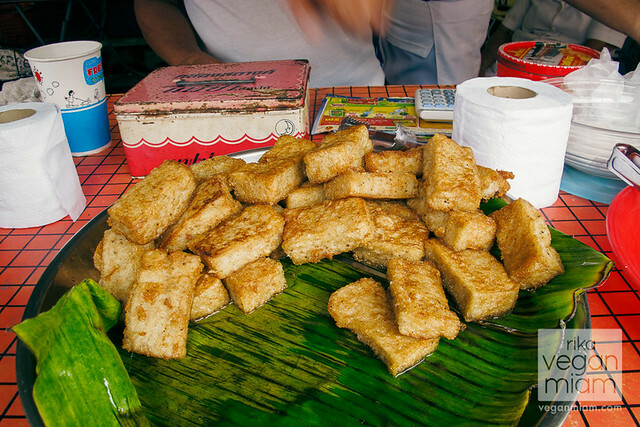 Phuket Vegetarian Festival (Ranong Road, Phuket Town): Brought back some fried Chinese turnip cakes with a bit of soy sauce at the condo. 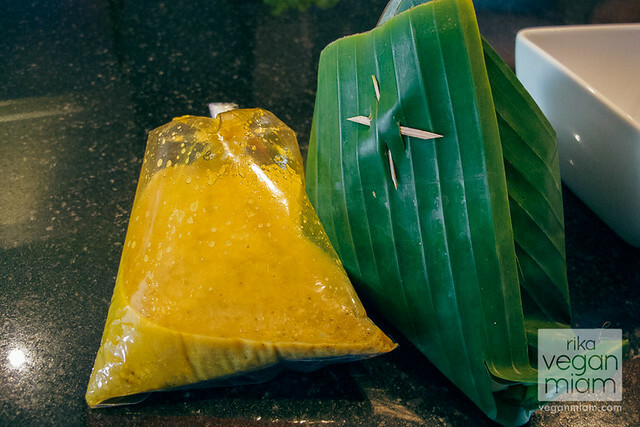 Phuket Vegetarian Festival (Ranong Road, Phuket Town): Yellow Curry Base Soup in Plastic Bags and Fresh Noodles with Scallions/Cucumbers/Green Beans are wrapped in the bamboo leaves. Phuket Vegetarian Festival (Ranong Road, Phuket Town): Warning, this is a very spicy Thai curry noodle soup. 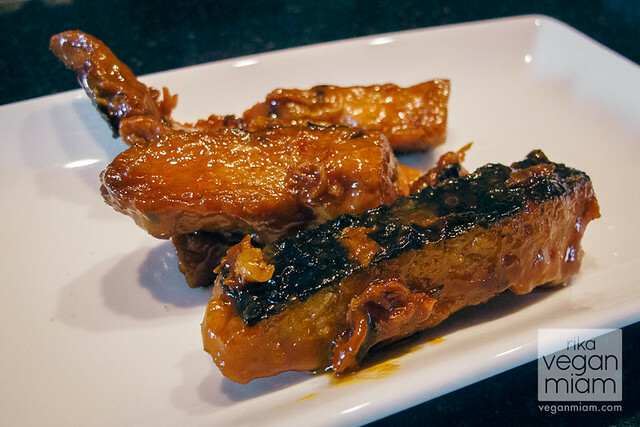 It is Doni’s favorite dish, it will literally burn your taste buds. 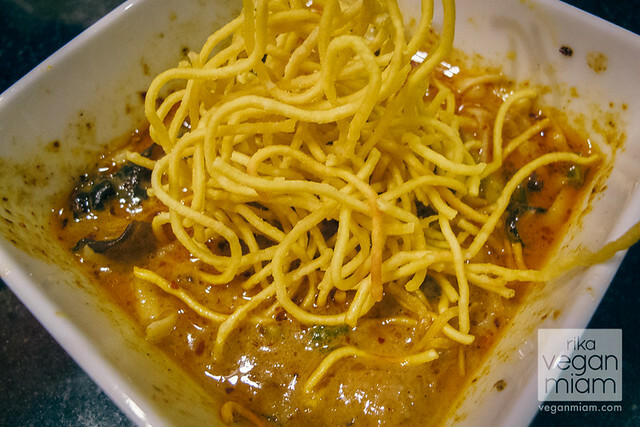 The coconut-based curry noodle soup is called, Khao Soi, that comes from the northern Laos and northern Thailand, topped with crispy vegan “yellow” noodles. 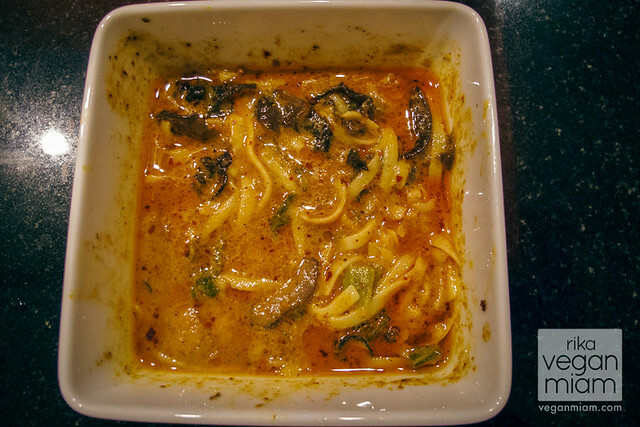 The dish traditionally used egg noodles, however the vegan version did not. 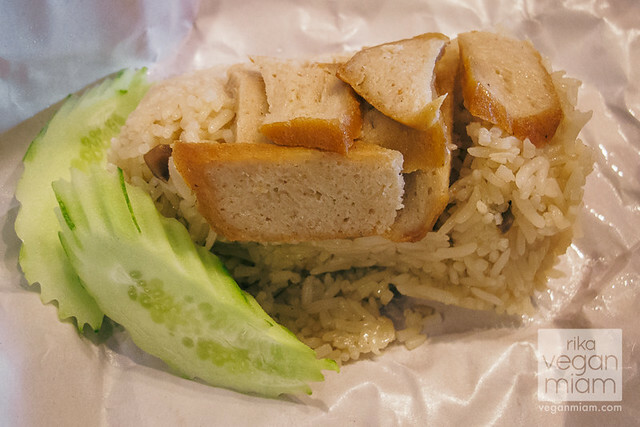 Phuket Vegetarian Festival (Ranong Road, Phuket Town): This is also one of my favorite savory meals from the Festival, of course deli-style wrapped: savory rice with fresh cucumber slices and mock meat. 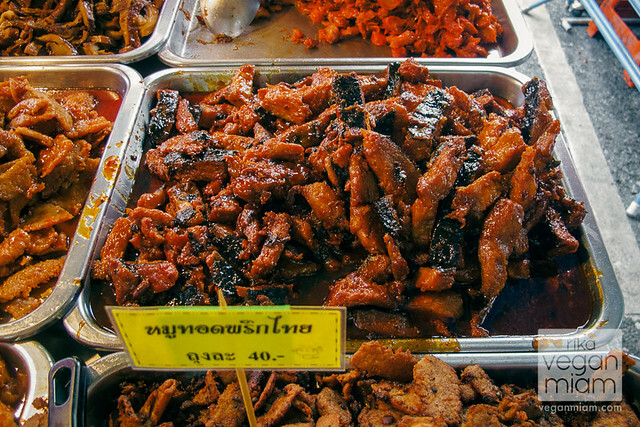 In Thai, they are known as, Khao Moo Grob, crispy “pork” on rice. It also comes with a bag of clear daikon soup (I can still taste the white pepper, which is tasty!) and a sweet soy sauce that accompanies the rice dish. The dish reminded me of a vegetarian Hainanese “chicken” rice I had in Kuala Lumpur few years ago. But it is slightly different. Phuket Vegetarian Festival (Ranong Road, Phuket Town): This is what it looked like in a proper dishware: Khao Moo Grob, crispy mock “pork” on rice drizzled with sweet soy sauce, and a bowl of mildly peppery daikon soup (it’s more like a broth for me). 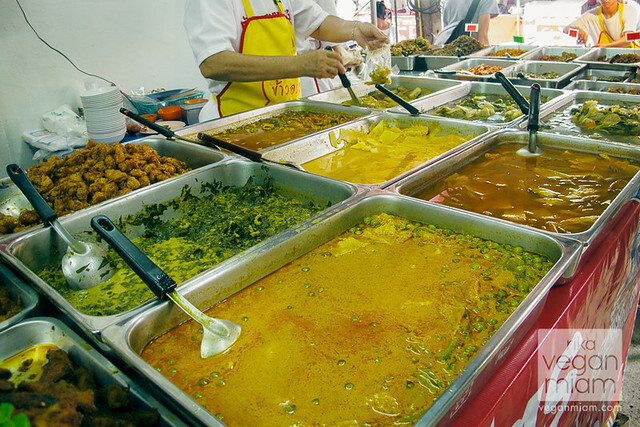 Phuket Vegetarian Festival (Ranong Road, Phuket Town): There were all sorts of buffet dishes consisting of tasty mock meats, curries and vegetables. 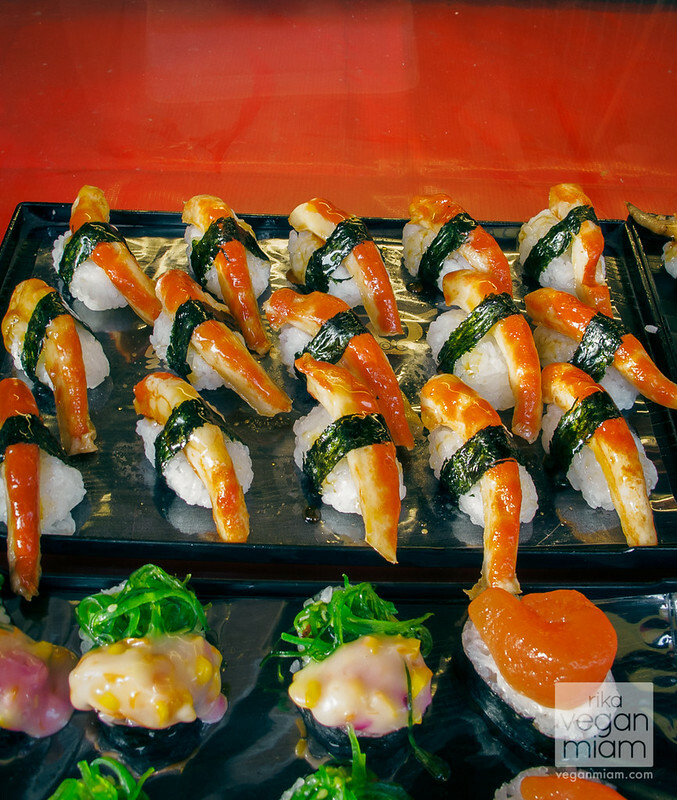 I haven’t tried their buffet dishes yet, the foods I’ve tried in this post were enough for us! Too full. 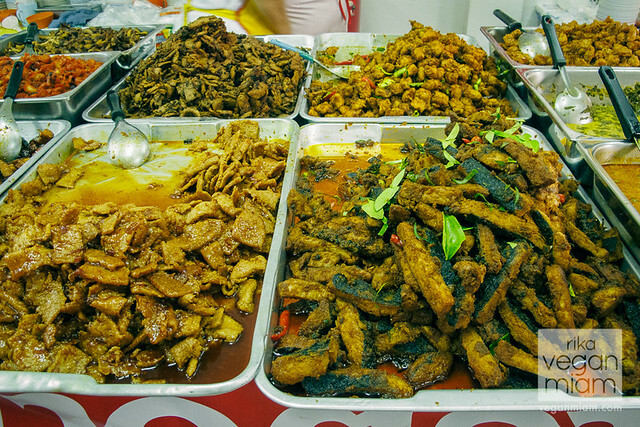 Phuket Vegetarian Festival (Ranong Road, Phuket Town): Loads of tasty and savory mock meat dishes – they are so good! Note, they don’t use garlic and onions in their dishes, but they still have tons of flavors. 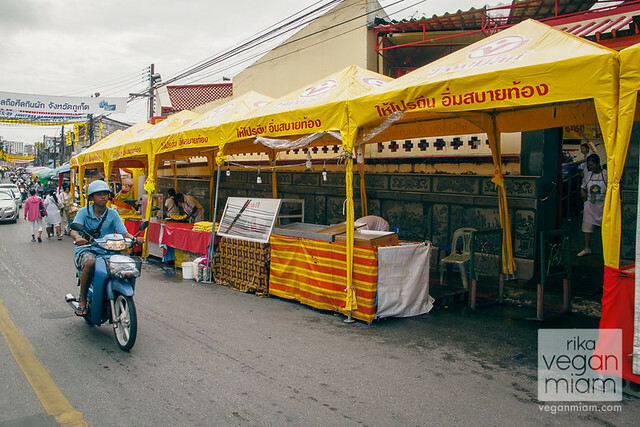 Phuket Vegetarian Festival (Ranong Road, Phuket Town): This was one of our favorite mock meat stalls – owned by a Singaporean. These are amazing mock meats, so tasty, juicy, perfect texture, and full of flavors. I hate chewy mock meats, they have very authentic texture! 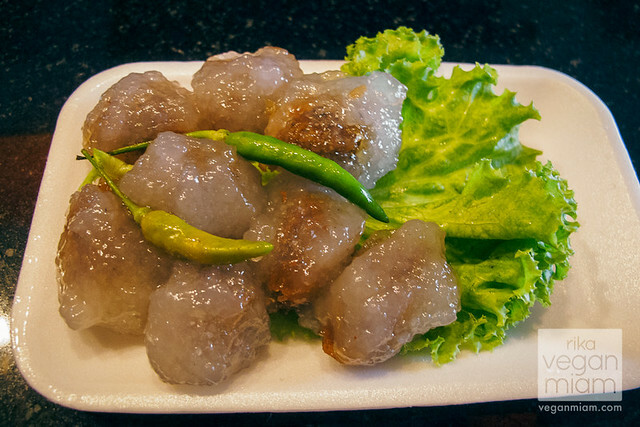 Phuket Vegetarian Festival (Ranong Road, Phuket Town): Saucy & Sweet Mock “Fish”, the coating was made of seaweed. They had two different types: Sweet or Spicy at our favorite mock meat stall. Phuket Vegetarian Festival (Ranong Road, Phuket Town): I love these Chinese chive dumplings . 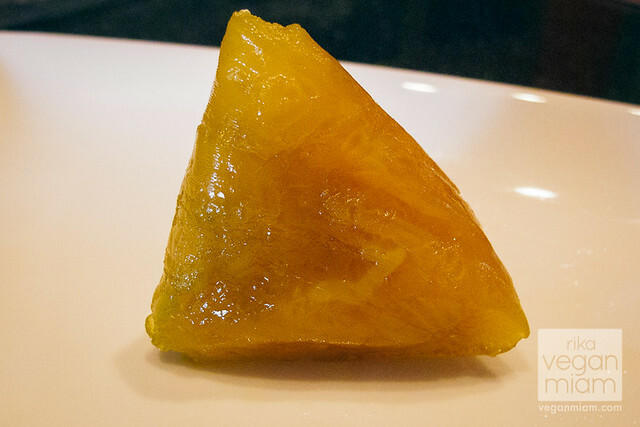 In Thai, they are known as Kanom Gui Chai. 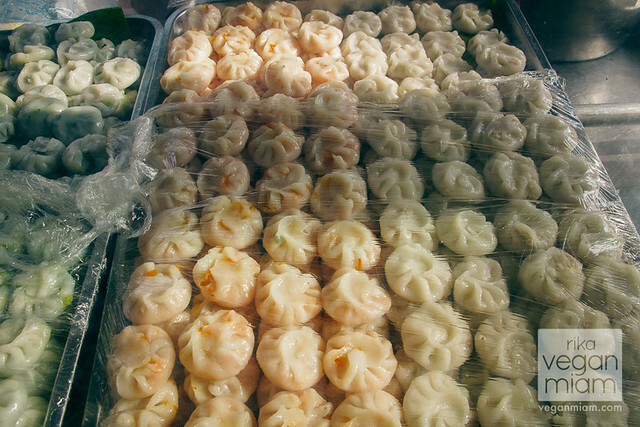 The dumpling’s exterior is made of sticky rice flour and tapioca flour. Traditionally they are made with garlic and chives, but for the Festival, they are not allowed to use garlic for religious reasons. I don’t remember what was the orange filling, I guess it wasn’t that memorable. 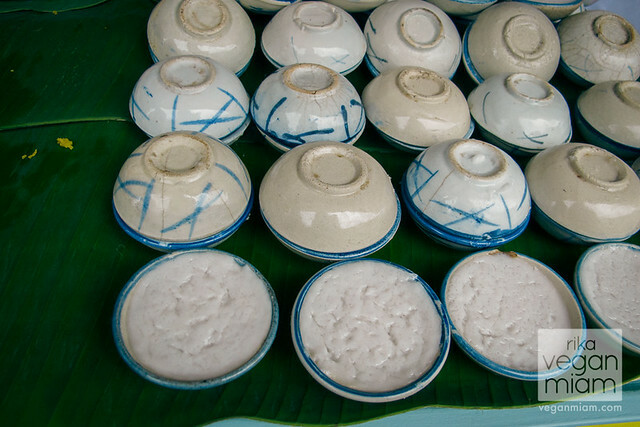 Phuket Vegetarian Festival (Ranong Road, Phuket Town): These are my favorite traditional Thai desserts – Khanom Tarn (Steamed Palm Sugar Pudding). 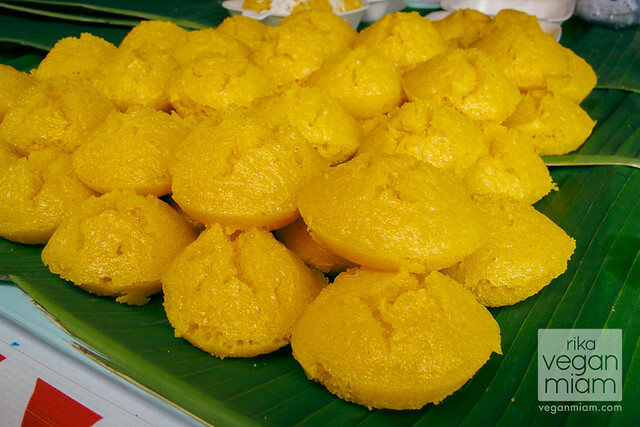 They reminded me of subtly sweet steamed cornbread cupcakes. 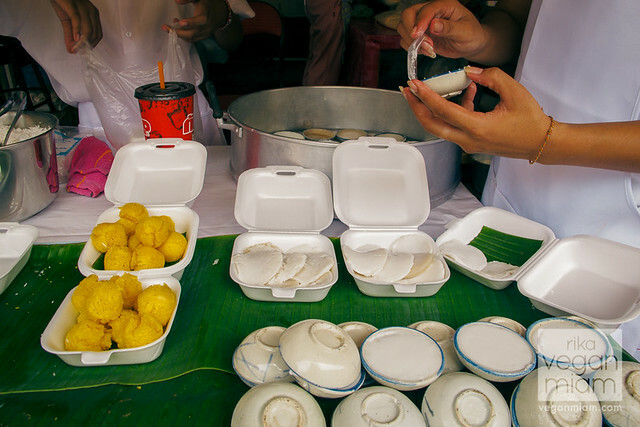 These desserts are made of a fruit, Tarn (or Palmyra palm), rice flour, coconut milk and sugar, and steamed in a banana leaf cup, and garnished with desiccated coconut. 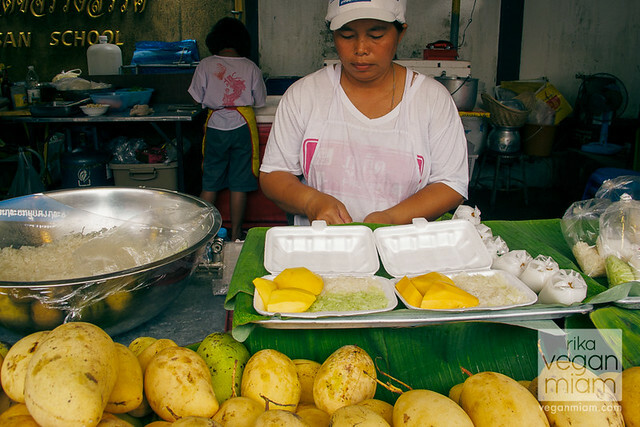 It is rumored that in Thailand, some use yellow food coloring instead of the fruit (Palmyra Palm). Phuket Vegetarian Festival (Ranong Road, Phuket Town): Vegan Khanom Tarn (Steamed Palm Sugar Pudding) garnished with desiccated coconut. 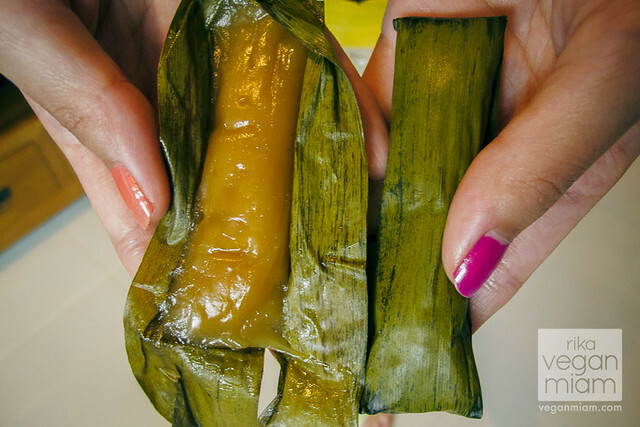 Phuket Vegetarian Festival (Ranong Road, Phuket Town): I am obsessed with these vegan steamed Khanom Tarn. I would love to make them in Oregon one day! 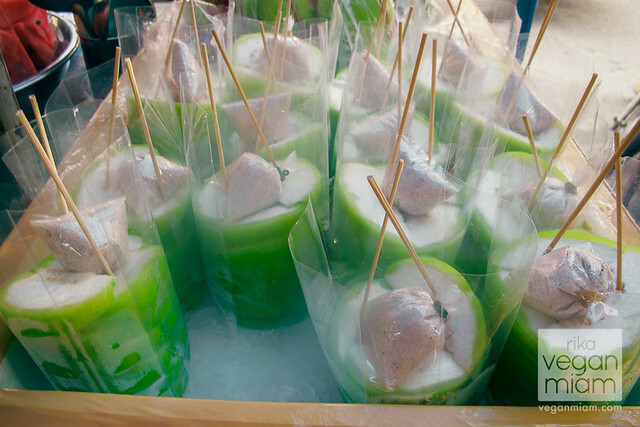 Phuket Vegetarian Festival (Ranong Road, Phuket Town): This is also one of our favorite snacks or desserts. 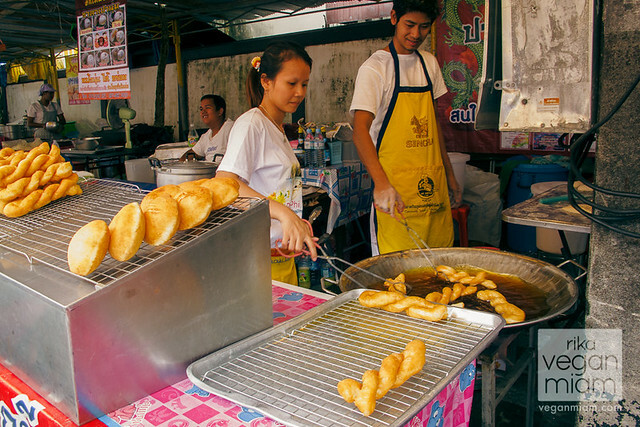 Fried Pa Thong Ko (also Chinese Donuts) with Green Pandan Custard. These fried donuts look a bit like Chinese fried crullers or dough sticks, and this pandan custard is very delicious! I would love to make this one day! 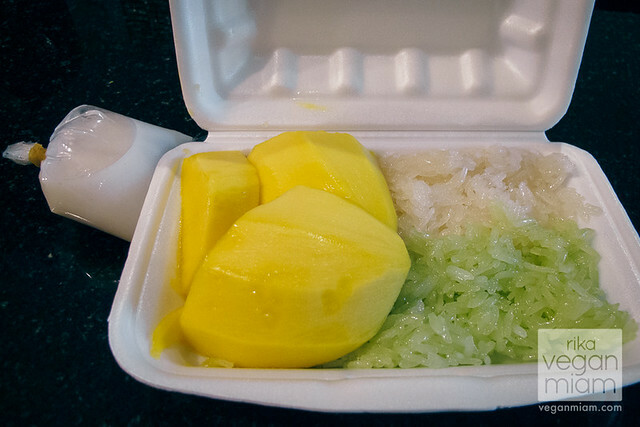 Phuket Vegetarian Festival (Ranong Road, Phuket Town): Love the Pandan Sticky Rice (Green) and the cute little sack of sweet coconut cream and you’ve got to try Khao Neow Ma Muang ข้าวเหนียวมะม่วง (Sticky Rice with Mango) during the Festival! Phuket Vegetarian Festival (Ranong Road, Phuket Town): We didn’t have the chance to try them because we enjoyed other Thai desserts. 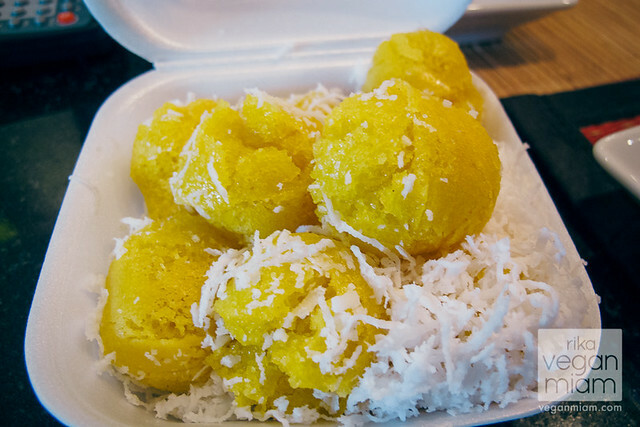 These are Khanom Thuay ขนมถ้วย (Thai Coconut Custard) usually made of rice flour, coconut milk and sugar and steamed in bowls. This dessert is great for coconut lovers! 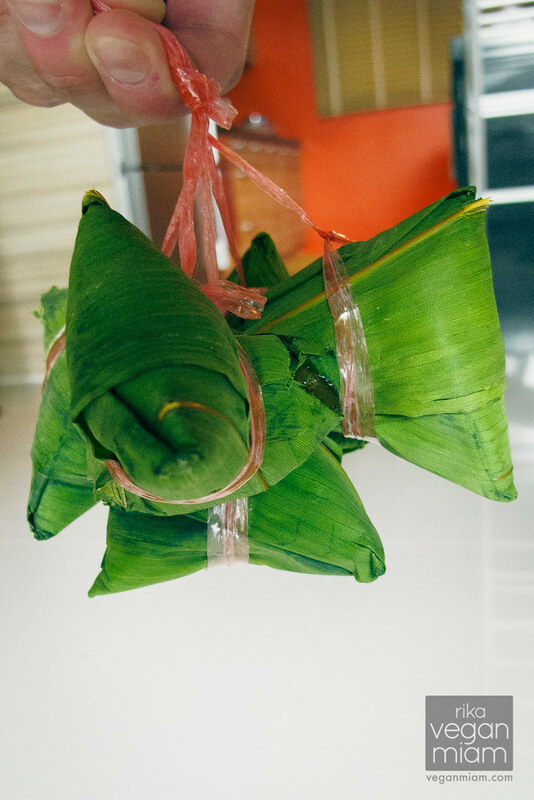 Phuket Vegetarian Festival (Ranong Road, Phuket Town): Vegan Khanom Thien (Sticky Steamed Rice Cake), wrapped in bamboo leaves and usually made of rice flour and sugar. I’m not a huge fan of sweet, sticky, and doughy cakes, apparently Doni liked it. I think I prefer my Khanom Thien savory or with bit of textures, perhaps with Azuki beans. 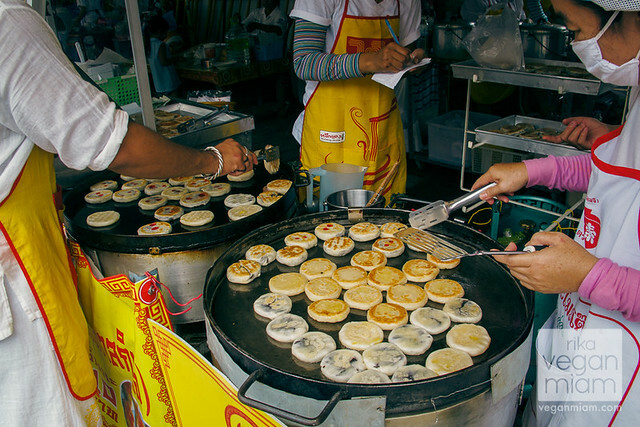 Phuket Vegetarian Festival (Ranong Road, Phuket Town): These are fried sweet Chinese pancakes with ample filling of red bean paste, but a bit different than a Japanese delicacy, Dorayaki (one of my favorite childhood sweets). They were very delicious when eaten warm! 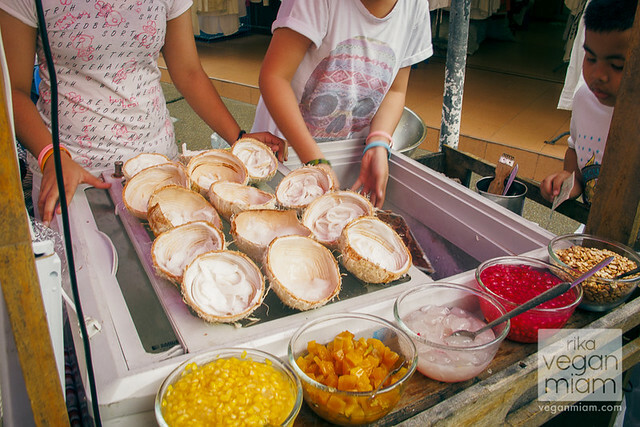 Phuket Vegetarian Festival (Ranong Road, Phuket Town): It is a coconut ice cream with a bit of coconut pulp, served in a young coconut shell. 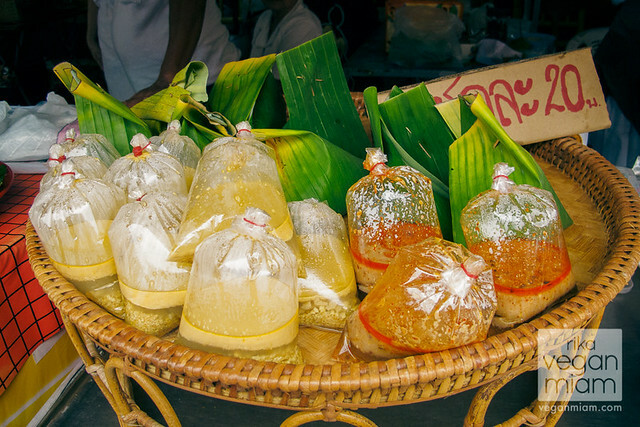 These colorful serving bowls consist of coconut jellies, kernels of sweet corn, and fruits in sweet syrup. 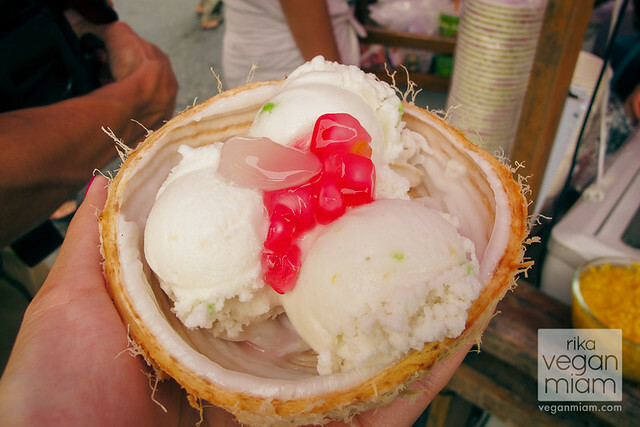 Phuket Vegetarian Festival (Ranong Road, Phuket Town): Vegan coconut ice cream topped with coconut jelly and lychee syrup. It was a perfect frozen treat in a humid, sticky, 90+ degree weather. 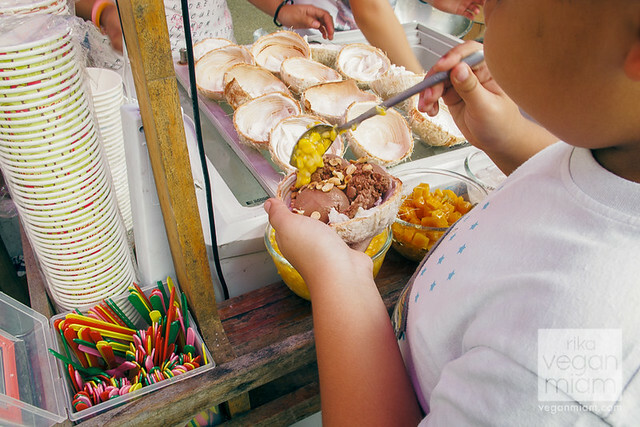 Phuket Vegetarian Festival (Ranong Road, Phuket Town): A Thai kid adding kernels of sweet corn and roasted peanuts onto his yummy chocolate coconut ice cream, hehe! Phuket Vegetarian Festival (Ranong Road, Phuket Town): Sour guava slices with palm sugar and chiles – a bit sour, sweet and spicy fruit dish. The guava is known as, “Fa-Rang”. 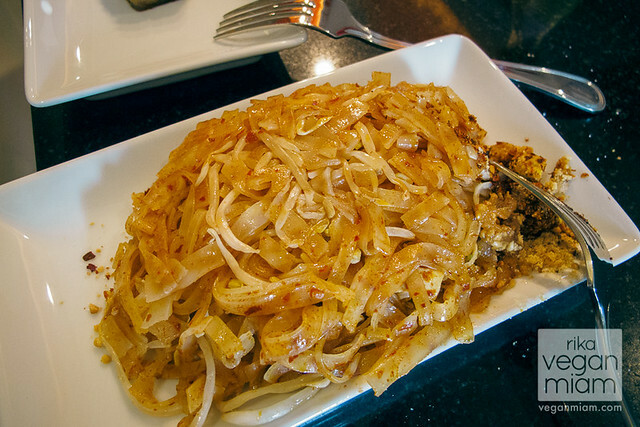 Have you tried any of these sweet or savory Thai dishes before – if so – which ones and where did you try them? 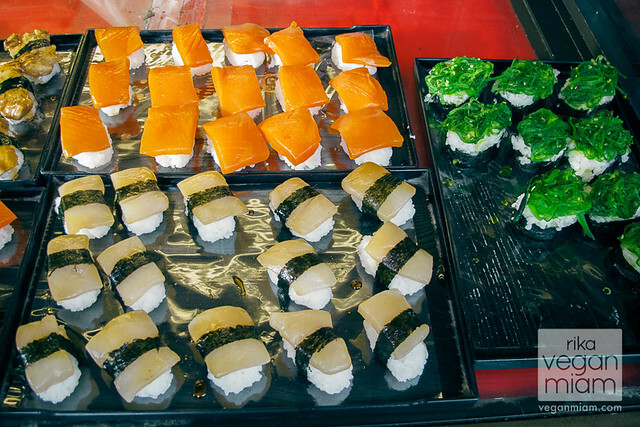 If not, which ones will you like to try? 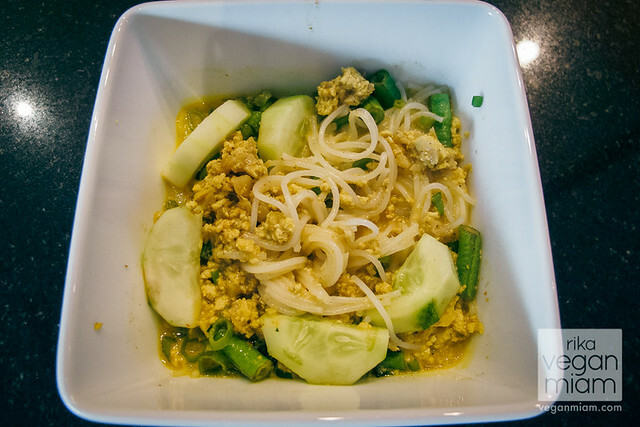 Which one is your favorite Thai dish from this post?